This interdisciplinary project will focus on a medieval map of Britain known as the Gough Map, now kept at the Bodleian Library, Oxford. This manuscript, of national and international importance, conventionally dated to c.1360, contains the earliest surviving cartographic representation of Britain in a geographically-recognizable form. Recent research has demonstrated that the map is in parts a strikingly accurate depiction of the locations of places, yet very little is known about how it was made, why, where and by whom. The project will attempt to answer some of these questions through a linguistic and paleographic analysis of the text on the Gough map. This work will be undertaken by Dr Elizabeth Solopova, English Faculty, Oxford University. This is an innovative approach to take with medieval maps, which will test transferability of techniques developed for the study of medieval manuscript texts to the study of manuscript maps. The project will investigate such questions as how many scribes worked on the present manuscript; where they were from; what their exemplars were like; what subsequent revision was undertaken, if any; and when did it take place. This will be achieved through a paleographic analysis of the map, but also through the study of the linguistic form of its place names, which reflects the dialect of its scribes and probably also the dialect of their patrons and the map’s original users. Since very little is known of the processes that were involved in medieval map-making, the insights achieved by the project will have significance beyond its immediate scope of study, and will contribute to ongoing debates about how maps were created and disseminated. The project involves a group of researchers from three institutions and will be directed Dr Keith Lilley, Queen’s University Belfast. The work undertaken at the Bodleian will be overseen by Nick Millea, Map Curator, Bodleian Library. The project will have a website hosted at the Centre for Computing in the Humanities, King’s College, London, where the work will be overseen by Paul Vetch. The website will feature a description of the research and technical development being carried out, with updates on progress, and a blog for project comments and discussion. It will also be the basis for the project’s online interactive Gough Map. This will be an enhancement of an existing version (created in 2005 as part of a British Academy funded project directed by Dr Keith Lilley), and will provide users with a means of accessing information on all of the places and features shown by the Gough Map. The online map will publicise the findings of this new research, and help disseminate the analytical results of the study both to academic and non-academic audiences, and across a wide range of subject areas. The project has an advisory panel comprising a linguistic historian (Professor Jeremy Smith) and a cartographic historian (Dr Peter Barber), both leading experts in their respective fields. The award from the AHRC ‘Beyond Text’ programme provides funding for an exhibition and colloquium at Oxford which will be held at the end of the project. The two-day colloquium will be an academic occasion to stimulate further discussion on the ‘language’ of medieval maps and map-makers. An associated exhibition focusing on the Gough map will be aimed at a wider audience and will be part of the Bodleian’s popular advertised exhibitions. The project will generate intellectual debate within its team and their institutions, as well as by extending this into the broader academic community and beyond through digital web-based media, the exhibition and colloquium. 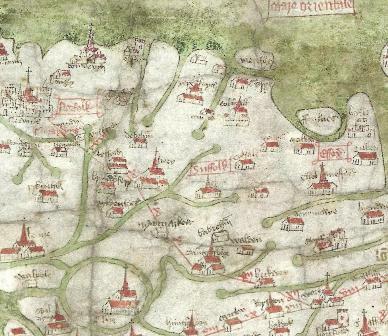 It will develop new ways of studying the ‘language’ of medieval maps to stimulate high quality interdisciplinary research across academic and cultural sectors.